because it didn't crack last year's numbers and they didn't say it sold a million, my guess would be anywhere between 920k and 950k. they haven't said anything at all though, I remember in the prediction thread people were like "welp guess Wii U didn't hit 2 million!" Nintendo sold -11.3% software ($ Revenue) this December compared to last December. Thanks to the launch of the PS4, Sony's software is up 37.0%. PS4 sales are really only about 47k below XB1? Wow and that's with it being sold out. I'll take back my previous projection about XB1 winning January. Cream is your forza 5 # right because Greenberg has it 450k and you have it over 500k? Wii ~150k is correct ? Did the chart angles. They were close to what shinra-bansho got, and as he posted, they do not work with the numbers we have. Therefore, can't use the chart. On the plus side, we don't need it for consoles! Here's what we got, so far. Sony should launch new hardware every year! By mixing Nintendo tracker and NPD tracker, it's over a million. That's for sure. We just don't know how much. Cream, I'd love to see one of yours 3DS and Vita overall LTD Charts. Like you did last year, remember? It's on a measly 20m or so install base. The fact that it crossed 1m at all is extraordinary. How much did the Uncharted games sell? Wow, Nintendo has dropped forecasts. I didn't expect them to do it this quickly. Wait Sony revenue from 1st party is up 43% right? It's not 43% of what it was in 2012? That's depressing as their line-up was far more robust this December compared to last year's; however, Wii software sales must have severely declined as well and unfortunately the 3DS software catalog did not offset the loss of Wii revenue. You got Super Mario 3D World numbers? Maybe he don't like special editions. 25m+. Is a big install base, but The Last of Us sales are very good of course. Just to confirm, The Last of Us is without bundle? I don't remember the exact numbers, but I think Uncharted 2 sold around 3 million. Maybe a bit less for Uncharted 3. Also, keep in mind that Call of Duty routinely sells ~5 million units in North America. Wow, I saw this thead at 5 pages 7-8 hours ago and now it's over 50 pages. I think Sony wants the global crown and MS just wants USA and Europe. Long term, Sony might edge out the win. I don't know about you guys, but my Xbox One, has been gathering dust, using it mostly for first party exclusives and the PS4 for first and third party moreso. All I know is my Vita projections are going to have to be revised downward. A platform selling that badly will be quietly phased out in short order. I think 2013 was Vita's last year on the American market. Shipments will be small if nonexistent until Sony announces its discontinuation on store shelves. To get to 20 million units I was hedging on America selling six to seven million units. Now I expect it to be discontinued. So 13-14 million units WW year 5. That's if the discontinuation does not have an effect on sales in other regions. It could go lower. I don't think Sony's going to be making handhelds much longer. That's kind of sad. I loved both PSP and Vita in theory. They just never really lived up to their potential of "Home console games on the go." In what world 80 million PSP sold is not living up to its potential? Some of you, ugh. PS4 is about 1.9 million correct? Is ps plus included in that number ? 480K is "good" or probably more accurately just "a lot higher than expected"... considering how poorly the Wii U has been doing. It's much higher than I personally expected for sure. It's still terrible in any wider context; e.g. last December Nintendo sold 1.1M units of home console hardware, this December that will only be ~630K. It's bad compared to past Nintendo December's for the likes of the GCN. On just PS3 CoD sells 5 million in NA? Wow, ND must be over the moon. Big selling game that sweeps almost every award imaginable. Well deserved success. Based on Aquamarine's numbers, unless my calculations are off, I have 2m. 1138K + 865k. Means the PS4 sold roughly 2.5m in the other territories whilst the Xbox One sold 1.2m. Opposite with me thanks to Dead Rising and Killer Instinct and the voice commands for everything else. Haven't touched my PS4 in weeks but will get all third party stuff on it for sure. Wow didn't expect it to be that close (PS4 and XBO). Definitely going to be an interesting next few months. Seeing the PSVita sales breaks my heart, and left me with one question, what is it that went wrong? 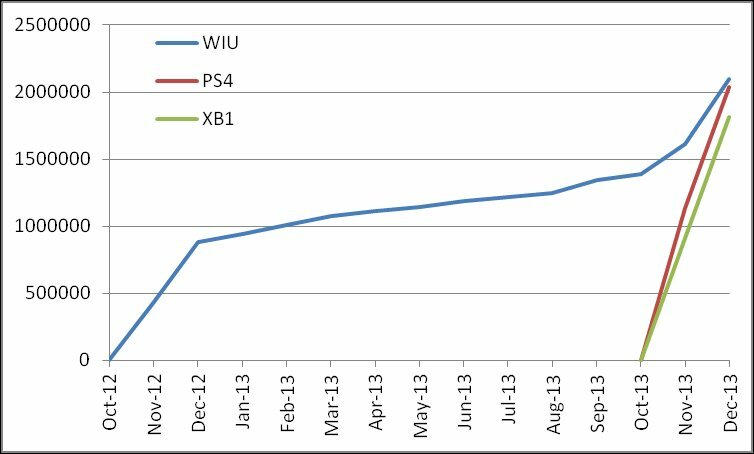 As mentioned above, Microsoft claimed 3m consoles sold WW by the end of December, Sony with 4.5m consoles. So deducting the US totals we have roughly 1.2m for all other regions sold for the Xbox One up to the end of December, and 2.5 million for the PS4. Where you compiling that from? Didn't say it was the top 5. But yeah, I may have done it wrong. I'll remove the post anyway to be on the safe side. I don't want to accidentally give out false information. I'm a little confused. NPD has Ghosts selling more on PS3 for the month of December and LTD, but creamsugar and a few other posts are saying ghosts sold more on ps4 than ps3? Am I reading something wrong here. I thought NPD lists in order by which console sold the best. Didn't say it was the top 5. But yeah, I may have done it wrong. I'll remove the post anyway. The problem with people saying that GT6 should have been on the PS4 is that the game still has tons and tons of PS2 "standard" models in its roster of cars. Forza 5 may get chided for lacking in content as far as cars and tracks go, but they made the decision to start from scratch 2 years ago, something Polyphony Digital apparently hasn't done since GT3 in 2001 when they reduced the number of cars from 650 in GT2 to 180 in GT3 (similar to Forza 5 from Forza 4). And since it took even 5 years to get a full GT game on the PS4, I feel like PS4 owners are going to be waiting forever for a GT game. Hence of course, the existence of Driveclub, which was meant to go head to head against Forza 5. Wow, great job Microsoft!! I think word of mouth will only help the X1 even more. It's a great product, well worth the 500 big ones.